Over the weekend, I had an interesting experience. Normally, I don’t go into my office then, which is across the street from my apartment. But yesterday the cable guy was coming to try to fix my Internet connection. During the past week my cable modem would suddenly “forget” its connection. It was odd because all the idiot lights were solidly illuminated. There seemed to be no physical event that was associated with the break. After I power cycled the modem my connection would come back up. I was lucky: I got a very knowledgeable cable guy, and he worked hard to figure out my issue. I will save you a lot of the description here and just tell you that he ended up replacing a video splitter that was causing my connection to drop. Cable Internet is using a shared connection, and my problem could have multiple causes, such as a chatty neighbor or a misbehaving modem down the block. But once we replaced the splitter, I was good to go. Now I have been in my office for several years, and indeed built it out it from unfinished space when I first moved in. I designed the cable plant and where I wanted my contractor to pull all the wires and terminate them. But that was years ago. I didn’t document any of this, or if I did have misplaced that information. But the cable tech took the time to make up for my oversight, He tracked down my misbehaving video splitter that was buried inside one of my wall plates. And that is one of the morals of this story: always be documenting your infrastructure. 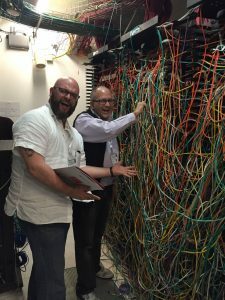 It costs you less to do that contemporaneously, when you are building it, then when you have to come back after the fact and try to remember where your key network parts are located or how they are configured. Part of this story was that I was using an Evenroute IQrouter, an interesting wireless router that can optimize for latency. I was able to bring up this graph that showed me the last several minutes’ connection details so I knew it wasn’t my imagination. Compare this with how they should look. This was taken in a demonstration area at Panduit’s offices. 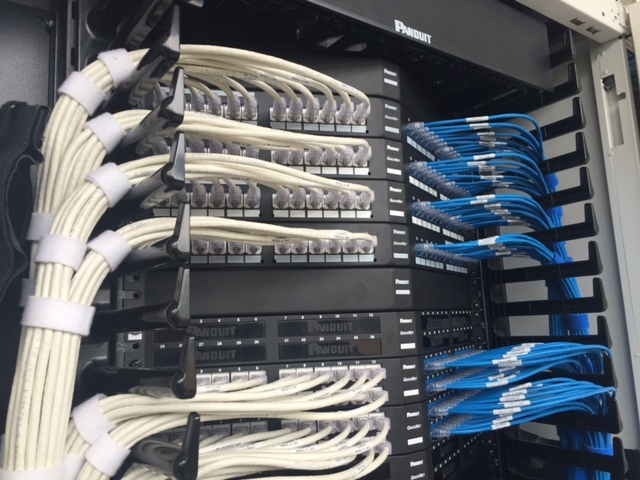 Granted, it was set up to show how neat and organized their cabling could be. Documentation isn’t just about making pretty color-coded cables nice and neat, although you can start there. The problem is when you have to change something, and then you need to keep track when you do. This means being diligent when you add a new piece of gear, or change your IP address range, or add a new series of protocols or applications. So many times you hear about network administrators that opened a particular port and didn’t remember to close it once the reason for the request was satisfied. Or a username which was still active months or years after the user had left the company. I had an email address on Infoworld’s server for years after I no longer wrote for them, and I tried to get it turned off to no avail. So take the time and document everything. Otherwise you will end up like me, with a $5 part inside one of your walls that is causing you downtime and aggravation. This entry was posted in Network applications by dstrom. Bookmark the permalink.